House party guest Ned Milford can see the inner passion and beauty that Annalise Fitzmanning hides. But how close should they become when his reason for being at Welbourne Manor would prompt a society scandal, not a society marriage! Her mouth gaped open. And then she laughed. This was the first time, Ned realized. The first time he’d seen her eyes light up and her mouth curl. The first time he’d witnessed her features melded together in glorious accord to produce exquisite beauty. Unbelievable, what a change came over her face. Unheard of, what effect her throaty, rasping laughter had on his body. It pounded a beat upon his ear which was quickly taken up by his pulse. It echoed through him, finally taking up residence in his stirring nether regions. So easily she did it, awakened these sensations within him—without any apparent effort at all. And she had called him potentially dangerous? Clearly the intelligent thing for him to do would be to steer clear, to leave her to the tender ministrations of Lord Peter Blackthorne. Ah, well. When had he ever chosen the intelligent path? A Regency house party turns into an invitation for romance in this trio of expertly crafted novellas. In Gaston’s richly nuanced “Justine and the Noble Viscount,” a nobleman finds himself distracted from his duties as guardian by the unofficial lady of the house. In Marlowe’s charmingly witty “Annalise and the Scandalous Rake,” an artist and a caricaturist match wits with wonderfully romantic results. And in McCabe’s exceptionally amusing “Charlotte and the Wicked Lord,” a man searching for a wife finds himself choosing an unconventional lady instead. Three delightful authors pen a trilogy of stories about the Fitzmanning’s, England’s most notorious family. The enchanting characters and their tender, sensual, warmhearted romances and atypical antics make for a sprightly, engaging anthology. The Diamonds of Welbourne Manor is a wonderful collection of stories showcasing the uniqueness of the characters featured in each story. At the same time we are treated to the talents of three wonderful authors. It is amazing at how seamlessly they united the three stories. The Diamonds of Welbourne Manor is an anthology designed to delight and satisfy the readers of not only Diane Gaston, Deb Marlowe and Amanda McCabe, but romance lovers everywhere. I thoroughly enjoyed this trio of novellas. It was cohesive, well-written and to the point. I never felt like there was an integral part missing, which sometimes happens with novellas. I would love for Ms. Gaston, Ms. Marlowe and Ms. McCabe to get together and fill us in on the rest of the brood – Nicholas, Stephen and Leo. The Diamonds of Welbourne Manor is a lovely book, pick it up. You won’t be disappointed. His life, his heart had become empty, with only his well-kept secret occupation to keep him company and feed his growing cynicism. His deepest passion of art has been buried one layer at a time through disappointments and roadblocks until Ned sets his eyes on Annalise at a Welbourne house party. Through her passion and zest for art and oils, and her outlook on herself and life, his heart begins to open to the possibilities of fulfilling his dream. And Annalise figures into those dreams and his heart. Unfortunately there are forces against them, strong enough that it may just keep them apart. Ms. Marlowe brought her characters to life. Throughout this story there are a plethora of moments and emotions that will tug at the reader’s heart and have them rooting for Ned and Annalise’s HEA. THE DIAMONDS OF WELBOURNE MANOR is a totally engaging read. 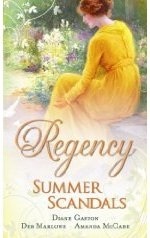 The three talented Regency authors work together splendidly. Their major accomplishment is in the consistently excellent characterization of all those connected to Welbourne Manor, not just the three heroines and their heroes, but also the brothers, Leo Fitzmanning and the legitimate Nicholas (now a duke) and Lord Stephen. The whole family are characters any reader would be pleased to meet, though I’ve barely touched upon them above. Surely the boys have heroines to meet and stories to be told. Ms. Marlowe takes a beautiful woman and pits her against a man who has a huge secret to hide. I love how Annalise is poised and beautiful and still manages to keep society on its toes with her artistic abilities and unconventional ways. Ned has a way of digging deep and seeing Annalise for who she is, even when her own family cannot. I thoroughly enjoyed this story and found myself enthralled with the characters.